Mobage's Arcade Ball is as likeable as it is simple. 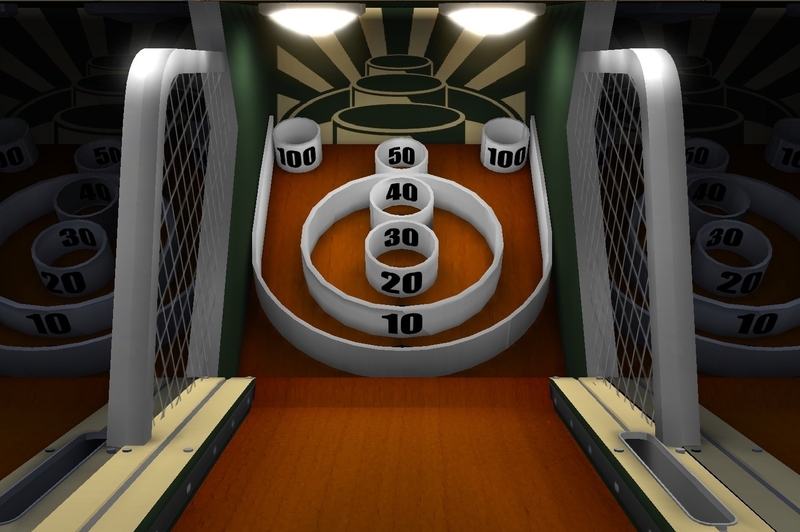 It's based on that old carnival arcade game where you roll a ball down a ramp, and try to make each shot land in the highest scoring hole possible. Players go head to head globally to see who can build the highest score, and you can have multiple matches running at once - handy if you find yourself playing against a slow-coach. If you prefer to play on your own, there's a cool practice area you can use to sharpen up your skills. For such a simple game, this is incredibly addictive stuff, and the physics are great too. Not only that, you earn tickets for playing the game which can be used to unlock objects that are placed within collections. These don't affect the game in any way, but it's nice to have something to work towards. Hit randomly selected special shots, and you can even get your hands on tokens which let you apply power-ups - score multipliers, Mulligans and the like. You'll very quickly master the 50 point score, which means that so will the majority of players - we're expecting online play to become quite predictable once this bar has been established across the playerbase. There's always the far trickier 100 pointers to go for, but we suspect most players will simply avoid them in favor of the rather safe score.